The Canaan Dog of Israel, is gaining popularity and no one is more qualified to pictorially present the ancient-new breed than this world-traveled AKC judge. Some 9,000 years ago, what is now considered Israel’s national breed, the Canaan Dog, already roamed the deserts, fields, and rocky lands, and with almost the identical phenotype as today’s breed. For more history on this “universal type”, see my article, The Universal Dog. Obviously there are no photos but the rock art drawings are extraordinary. Similar primitive types exist all over the world, as a result of homogenization of free-roaming wild or feral dogs, especially those of the Indian Wolf family rather than the Arctic Wolf family. 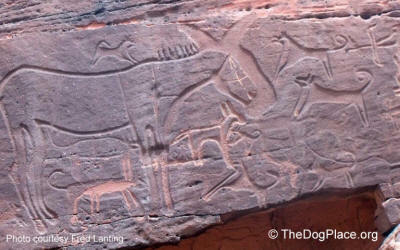 Petroglyphs (right) recently found in Saudi Arabia depict what appear to be Canaan Dogs. 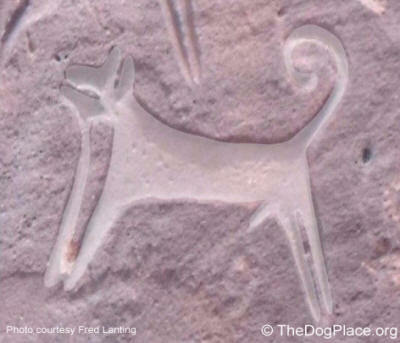 At present, these are archaeology’s earliest depictions of dogs and show their historical use in hunting strategies, in which man’s best friend ran its prey to exhaustion, while man followed behind, similar to how many animals are still hunted today. 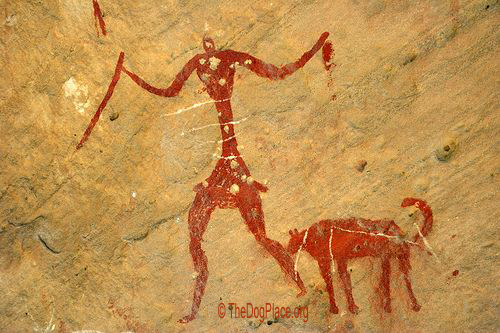 Rock art in Saudi Arabia showing what appears to be Israel's national breed depicts vivid scenes of man's earliest known use of canines in taking down prey. Remarkably, the Saudi scenes show dogs leashed to hunters. 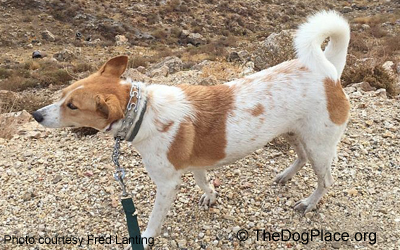 Shuwaymis site shows a typical Canaan dog. and its young, surrounded by dogs. the lion may represent a tool to butcher/skin animals. It is pretty obvious to us experienced dog people that Homo sapiens have been training and using dogs in much the same way for the past ten thousand years or so. 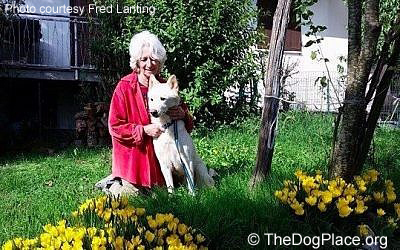 Foremost Canaan Dog expert Myrna Shiboleth and her dog Habibi in Italy, 2017. There are somewhere between 2,000 and 5,000 purebred Canaan Dogs in the world today, with approximately 1,000 of them in Israel. 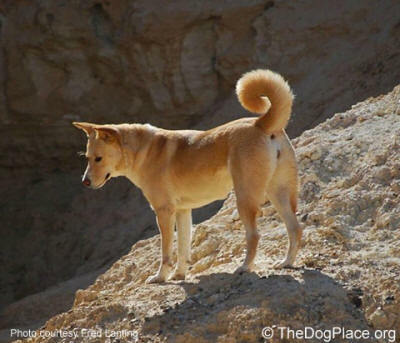 The canids on the Saudi and Egyptian walls bear a close resemblance to the modern Canaan Dog. All of the hundreds of etched dogs found in the two Saudi sites “display characteristic pricked ears, short snouts, and a curled tail, appearing to be of the same type.” Most of the country’s current wild and shelter dogs are crosses with the breed, because different breeds have been brought into the region over more recent time. The Canaan Dog was first recognized in Israel as a registered breed in 1965; The Canaan Dog gained AKC recognition in September 1996. The United Kennel Club (UKC) had already recognized the breed as the “Israel Canaan Dog Club of America” in 1992.. According to the “parent club(s)” in the US, this breed has few genetic or health problems. It is often very vocal, and [sometimes] shy. Where are the Canaan Dogs from and how did they get there? 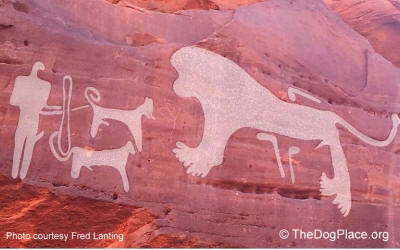 The dogs depicted in the petroglyphs are ancestors to the modern Canaan breed in the Levant, but possibly evolved earlier in Arabia and moved to Israel at a later period rather than vice versa. 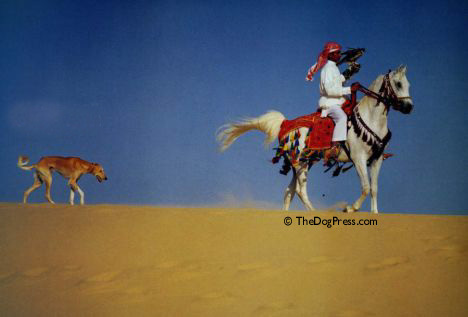 “The Arabian Peninsula dog depictions and modern Canaan Dogs may represent a case of convergent evolution; or two unrelated groups of dogs adapted to harsh, arid environments,” write the authors of the Jrnl of Anthro. Arch. study. According to a 2015 article in the journal Nature, “dogs were first domesticated in southern East Asia 33,000 years ago. Around 15,000 years ago, a subset of ancestral dogs started migrating to the Middle East, Africa and Europe, arriving in Europe at about 10,000 years ago”. A 1978 Nature article shows evidence for domestication of the dog 12,000 years ago in Israel. 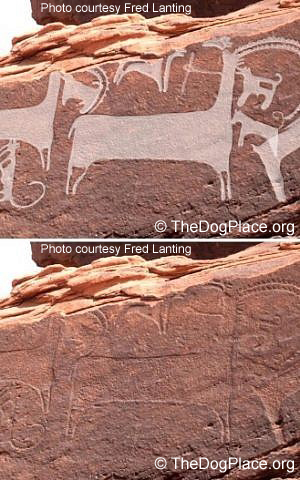 As mentioned earlier, the Saudi rock carvings are dated to circa 9,000 years ago, well after canine migration to the region. They would have taken considerable time to produce, say scientists. “Chiseling stone is time-consuming and labor-intensive, so the effort would have had meaning behind it… Therefore, the artists deemed their subjects important enough to record in such a lasting medium,” according to the website Arabian Rock Art Heritage, documenting the Saudi petroglyphs. 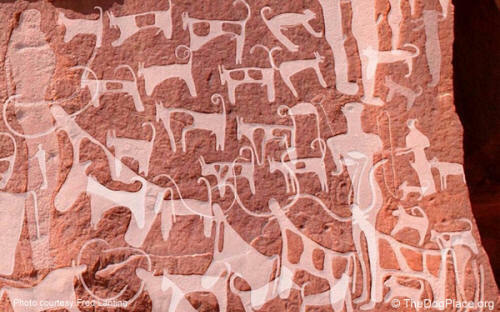 That rock art includes graphic scenes of canines locked in death-grips on the necks of ibex and gazelle. What is clear is that the scenes are evocative. “It’s a little bit heart wrenching, the equids are usually mothers with their young being attacked,” said Guagnin, who over the past three years has analyzed over 1,400 panels of petroglyphs. “It’s quite interesting to see these scenes with the dying animals and dogs hanging off them,” she said in a New York Times article. “Were Israel’s Canaan Dogs man’s best friends 9,000 years ago?”, 24 November 2017. All cultures worshipped or utilized dogs even Muslim countries. Which breeds are best for high-rise living, as working farm dogs, great with kids or better as a guard dog? Dogs didn't evolve, this animal came already domesticated!